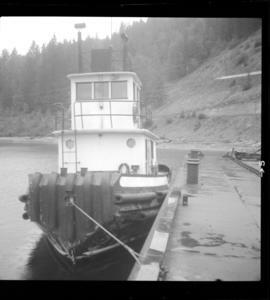 Photograph depicts a privately owned tug of the Interior Lake Services called "Iris G." It was used to haul rail barge #6 between Slocan and Rosebury on Lake Slocan. It was in 1956 in New Westminster. 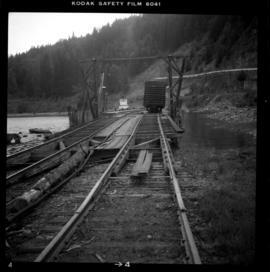 Photograph depicts the beginning of the 27 mile branch to Nakusp. 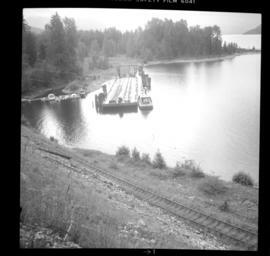 Visible is an 8-10 car transfer barge #6 and a tug named "Iris G."
Photograph depicts barge #6 coupled to a rail barge slip at the northern end of Slocan Lake. A locomotive had already switched 3 cars onto the barge. It included 2 pole cars and a refrigerator box holding lumber. Photograph depicts a barge slop on Slocan Lake. Visible is transfer barge #6 and a tug "Iris G" found alongside it. The lake operation was contracted out in 1956. 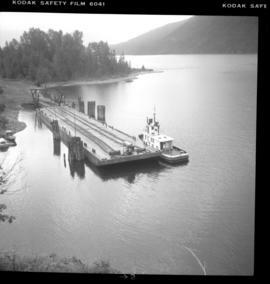 Photograph depicts a barge slop on Slocan Lake. 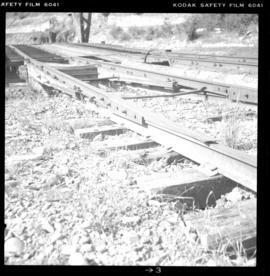 Displayed are the details of rail joints that were moored between, while the floating the and trackage were on dry ground.